Salted egg is a general term for egg-based dishes which preserved by marinated (given the excessive salt to deactivate the decomposing enzyme). Most salted eggs are duck eggs, although it is possible for other eggs. Salted eggs properly consumed within one month (30 days). 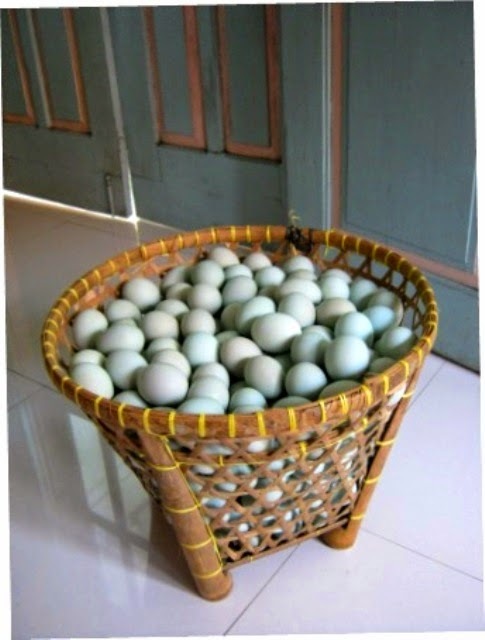 In Indonesia, particularly in Java, salted duck eggs are usually produced from dash runner ducks which their eggs have green eggshell-blue characteristic. These snacks are practical and can be combined with a variety of dishes –with or without rice. Fishermen who sail or people who are traveling for a long time used to take these eggs. In Central Java Province, the Brebes area is known as a major producer of salted egg. High quality salted egg can be characterized by bright orange to reddish yolk part, dry texture, no fishy smell, and gentle salty taste (source:wikipedia). I have a bucket of salted eggs for my late Blue Monday. There are some salted egg producers in my husband's hometown. The eggs captured in my FIL's home. My SILs used to buy these eggs as souvenirs for their neighbors and co-workers. I've never had them, but I bet I'd like them. Thanks for playing today. I remember the Mama making salted eggs in the water softener, which is full of salt, when I was a kid. Eating a salted egg once is enough for me.